For most of us, there comes a time when we look around our living room design and it no longer has the luster that we want it to. Maybe you adopted a trend a few years ago that now feels stale and outdated, or perhaps you added someone to your household who brought some less-than-ideal furnishings along with them. Regardless of your reasoning, most people are ready for a style refresher at some point or another. But knowing that you want a living room update is a lot different than achieving it. Fortunately, there are quite a few small changes you can make to your space to completely transform your look without needing to invest in expensive furniture or paint jobs. The following simple updates are a cinch to apply and will have you falling in love with your space all over again. One of the fastest and easiest ways to transform your living room design is to update your throw pillows. These accents are often the first things people notice when they enter a space, and they have the power to infuse your look with more color, style, and personality. If you’re currently rocking monochrome pillows, consider picking up some compelling patterns, like these showcased from Style Curator. You can also play with different textures, like fringe and leather, to add more dimension to your design. Rugs have a knack for tying a design together, so whether you’re adding a rug where there wasn’t one or swapping yours out for a new one, it's a no-fail way to infuse your look with new life. And the beauty of this idea is that there are endless varieties to choose from. A shaggy patterned rug, like this one from The Everygirl, will add warmth and intrigue to your look while a flat, monochrome rug brings definition. Your walls pack a lot of power when it comes to defining your design. But that doesn’t mean you have to repaint the whole room to make an impact; simply switching up your wall decor is enough to create a big change. If have a gallery wall at present, consider replacing it with one big piece of statement art. Or, if you’re working with a mirror, swap it out with a sophisticated ledge gallery, like this design from @kismethouse on Instagram. What’s especially great about this idea is that you don’t need to add anything new to your space. By simply rearranging your furniture, you can completely transform the look and feel of your living room. When you’re rearranging, be sure to pay mind to visual weight. For instance, if you have one large item on one side of the room, balance it out with a similarly large item or a cluster of small items on the other. This room by Amber Interiors perfectly exemplifies this approach. Your coffee table is essentially the centerpiece of your living room, so updating your coffee table look—or creating one in the first place—is a great way to refresh your look. Your look, or the things you put on it, doesn’t need to be elaborate to make an impact. Simply arranging a few thoughtful items, like candles and fresh flowers on a nice tray, like this look from The Everygirl, is all it takes to uplift your design. Shelves are a stellar addition to your living room because they don’t take up any square footage while they showcase your favorite items to reflect your personality and style sensibility. You can stagger small shelves to display little knick knacks and add movement to your look. 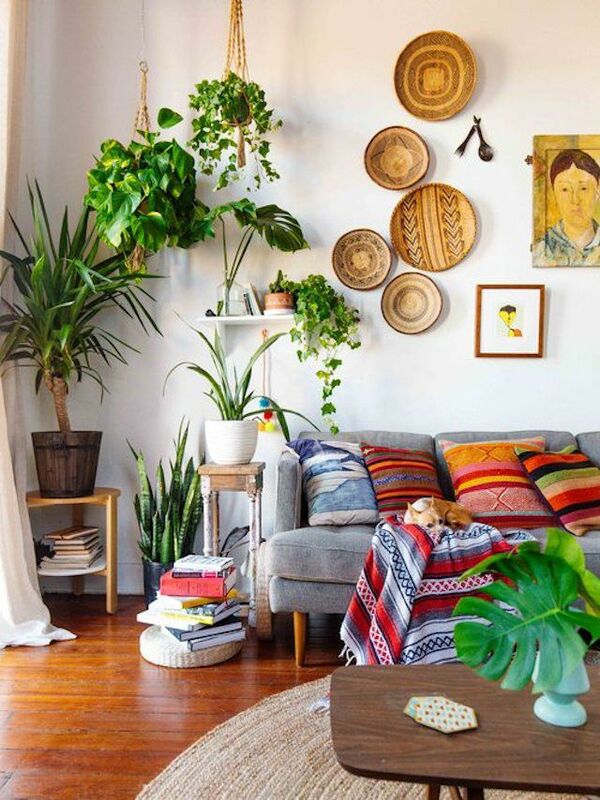 Or, you can place a set of floating shelves in the corner to showcase a cohesive collection of your favorite decor, such as this example from @ohmydearblog on Instagram. A lot of people overlook the ability of plants to make a stylish impact, but greenery never fails to add life (both literal and figurative) to a design. Plus, it’s one of the few decor options that can truly work with any aesthetic.